Hamilton's youth was filled with anomalies. The future American was a native West Indian, born on the British island of Nevis and raised on the Danish island of St. Croix. 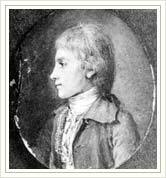 His father, James Hamilton, was Scottish; his mother, Rachel Faucett, was of Huguenot ancestry. They were not married. The islands' sugar industry, worked by slaves, produced enormous wealth, which Hamilton viewed only at a distance, from his lowly position as a clerk. In 1773 benefactors sent him to New York to be educated. There, his life took a dramatic turn. Alexander Hamilton was born on Nevis and raised on St. Croix (Sta. 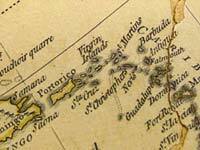 Cruz on this map) in the Caribbean -- islands made rich by sugar and slaves. 1745 Rachel Faucett marries John Lavien. 1750 Rachel Faucett leaves her husband. Early 1750s She meets James Hamilton. 1757 Alexander Hamilton is born on Nevis. 1763 The Seven Years' War ends. 1765 Rachel and James Hamilton move to St. Croix; James Hamilton abandons his family. Stamp Act Congress protests British tax. 1766 Alexander Hamilton begins clerking at Beekman and Cruger (later Kortright and Cruger), in Christiansted, St. Croix. 1773 Hamilton is sent to the 13 Colonies.